Search for Design Thinking on your favorite search engine and you’ll find an array of blog posts, videos, and articles. While Design Thinking isn’t new, it’s a topic that’s been much talked about in recent years, increasingly in business circles. For additional evidence of its growing popularity in business, look no further than this year’s Forté Foundation MBA Women’s Leadership Conference. The event featured a 45-minute Enterprise Design Thinking workshop facilitated by IBM, a title conference sponsor. With over 160 attendees participating, this was the most popular session of the event. 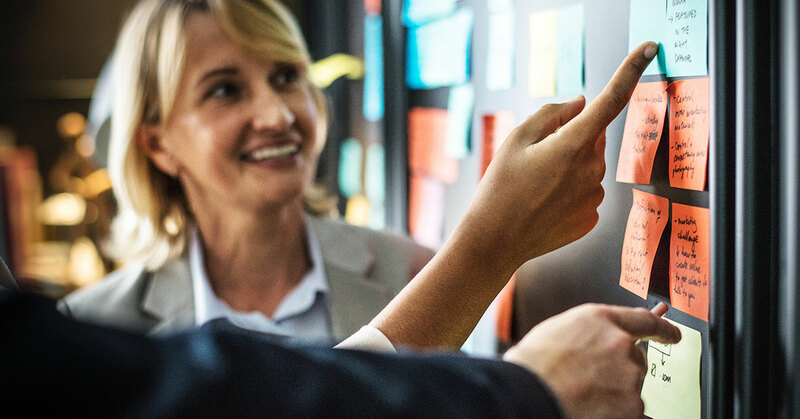 Read on to learn more about Design Thinking, its role in the session held at this year’s conference, and three things MBAs should know before applying it. At its core Design Thinking is a collaborative, iterative approach to problem-solving that leverages empathy with end-users, or consumers, to develop solutions to challenges. While conventional approaches to problem-solving in business might consider the needs of consumers alongside business goals, Design Thinking prioritizes the consumer and uses her perspective and habits as the basis for developing solutions. Additionally, it involves users in the design of solutions and relies on iteration to refine ideas into solutions over time. Think about it as the difference between optimizing a convenience store’s layout for business parties such as suppliers, employees, or store managers rather than customers. While designing from the perspective of business parties might result in efficient stocking or management, designing from the shopper’s perspective will likely result in a solution that is easier to navigate, increasing satisfaction with the store and its products. Using Design Thinking, customers would be consulted on store design and multiple store prototypes would be created as designers refined and optimized the layout to meet their needs. Note that this is just one example and Design Thinking could be used to optimize for both business parties and customers in this scenario. The key takeaway is that often the customer’s perspective would not be taken into account or considered as a priority in solutioning. Some 45 years later, promoting good design is still important. While IBM did not invent Design Thinking, we leverage our own version of the methodology with a focus on applying Design Thinking at the speed and scale of the modern enterprise’s demands and delivering outcomes. This means that we not only leverage Design Thinking to develop ideas but also use it to build the solutions envisioned. This is the methodology that attendees learned at this year’s conference. (To learn more about the principles of IBM’s methodology, visit the IBM Enterprise Design Thinking website. Led by a team of 12 IBMers, attendees were asked to focus on Courtney, a resident of Forteville, a bustling mid-tier city with a newly developed sports and entertainment district. 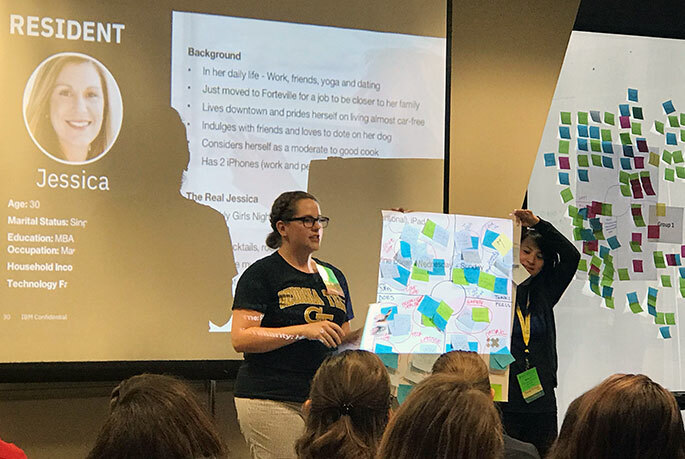 Over the course of the session, they documented their understanding of Courtney in small groups by creating an empathy map and then learned how to use this understanding to develop solutions to her everyday problems such as housing, entertaining friends, self-care, and transit. It’s not just for designers. As the convenience store and Forteville examples above demonstrate, Design Thinking is not just for designers. Anyone can use it to frame problems from the perspective of the end-user and develop solutions that resolve their challenges. There are many “right” approaches. Design Thinking is always collaborative, iterative and takes user needs into account, but there are multiple ways to apply it. Companies can develop their own approach to Design Thinking, as IBM did, and even within academia, schools and professors will have differing perspectives on how it should be taught and practiced. No technology or tools are required to use it. While you might frequently hear about Design Thinking associated with technology projects or companies, it can be applied in technical and non-technical environments and requires little to no tools or equipment. All you need is some creativity and a commitment to empathizing with the user. Kamaria Campbell is an MBA alumna as well as a Digital Strategy Consultant and Design Thinking Coach at IBM.